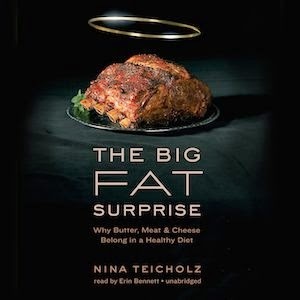 Message from Nina: "The meat/dairy/egg industries have committed their fair share of sins, but so have the manufactured food industries as well as the companies involved in the production of unsaturated fats (the food that has increased more than any other in the 20th century, largely because we were told to replace saturated fats in animals with unsaturated fats in plants.) These companies include ADM, Monsanto, Bungee, Cargill, Procter & Gamble, Mazola, Corn Oil Products company, ETC. These companies are far bigger and more powerful. The anti-meat bias in the US has led us only to focus on the problems of one set of products. Americans ate three to four times more red meat 150 years ago than we do today. Before 1900, American housewives cooked mainly with butter and lard."